As I play through The Elder Scrolls Online, I wanted to create a few video guides that show off some of the less obvious things in the game. Follow the eciov YouTube channel for more content like this. In the video below, I show you how the in-game armor dying system works. The dye stations can be hard to find, but they add a completely new dimension to the look of your character. Personally, I feel like the stock armor in the game is a little boring aesthetically. Unless you get a full set of special armor, you’re stuck with dark colors and dull equipment. By adding a little dye to the equation, you can create amazing designs that shape your sense of identity in the game. If you have multiple characters, you can share your unique design with all of them so your Guild knows who you are on sight. Watch the video, and let me know if you have any questions about the dye system. Send a message to @burlimonster in the game or just comment on our YouTube channel. The next video is a topic I’ve meant to cover for a while: the Crown Store. In The Elder Scrolls Online, Zenimax (the game’s publisher) added a way to use real money for special items in the game. However, you can’t use real money for “pay-to-win” advantages. In fact, the whole real-money system is there to improve aesthetics and offer simple buffs for normal gameplay. You cannot buy your way to a high-performing character with the Crown Store. 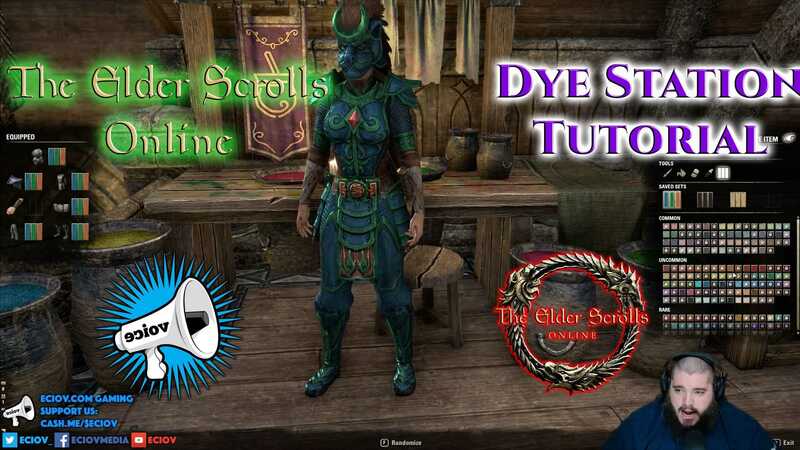 Watch the video for a full tutorial of the Crown Store, and let me know if you have any questions. I would like to see a few more things added to the store eventually. The mount selection is a little scarce; it could use a few more animals to help with our unique identities. I’d also like them to make bag/bank space purchasable with real money. It’s extremely expensive with the in-game gold and takes weeks to save up money for the next slot level. My next upgrade is 42,000 gold. Yeesh. If you have other things you’d like to see in the Crown Store, let us know in the comments.